Bespoke flower pictures, alternative wedding guest books and many more. Prices start from £45.00 for hire or £85.00 to buy and are dependent on your requirements. All pieces can be colour matched to your scheme and flowers. Our beautiful flower bars can be made to any size with either mirrored or coloured tops and bases. These are made in a very similar way to our flower walls and are all Handmade at Festival HQ - £50 for base unit, £75 when fully loaded. A beautiful statement piece for your party or event. 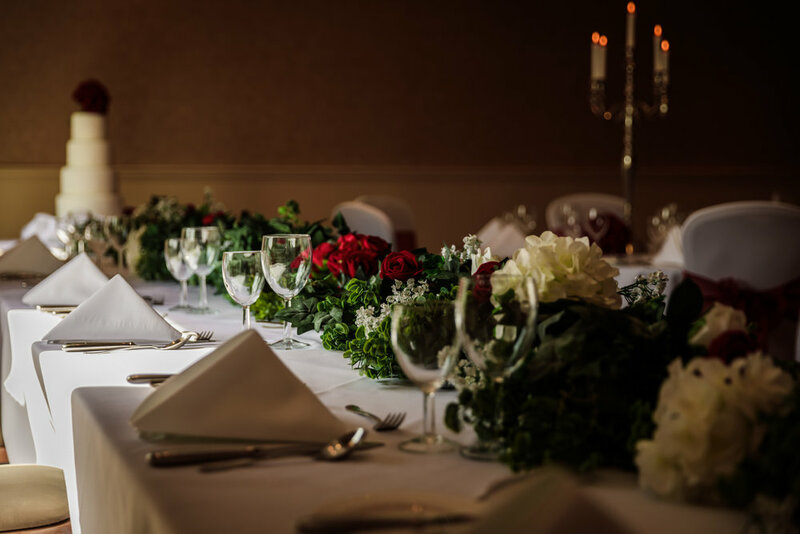 Ask us about personalisation elements that can make the bar you hire a stunning centrepiece to your special day. Also available to buy. Handmade at Festival HQ. Featured piece £75. Here we have a slightly smaller flower bar at 80cm x 40 cm with the red ombre spread. 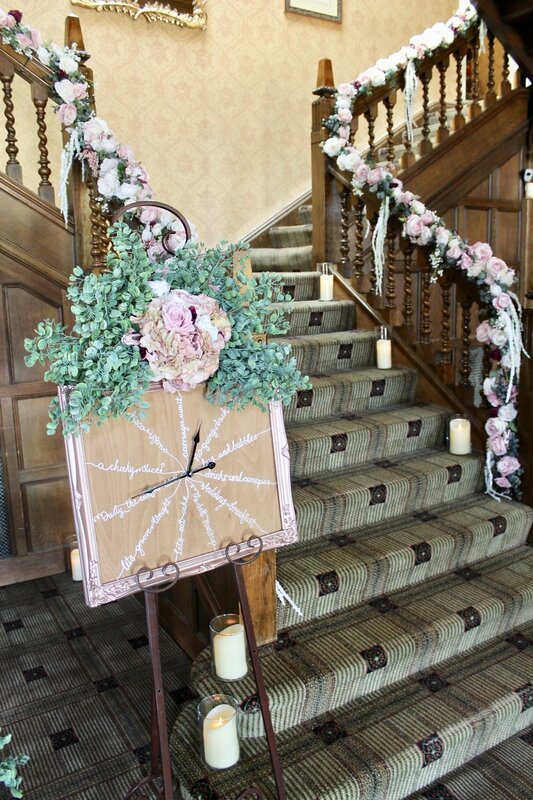 These come in at from £150 to hire and from £325 to buy and we will ensure that the backing comes with personalised colour scheme to match your venue decor. The White bars above start at £50 to hire for base panels alone, or £75 if fully loaded as in the images. Top and bottom panels are bespoke to your particular installation and are treated to make sure that they can withstand the toughest of use. Should you wish to buy a permanent installation these start from £150 to buy. 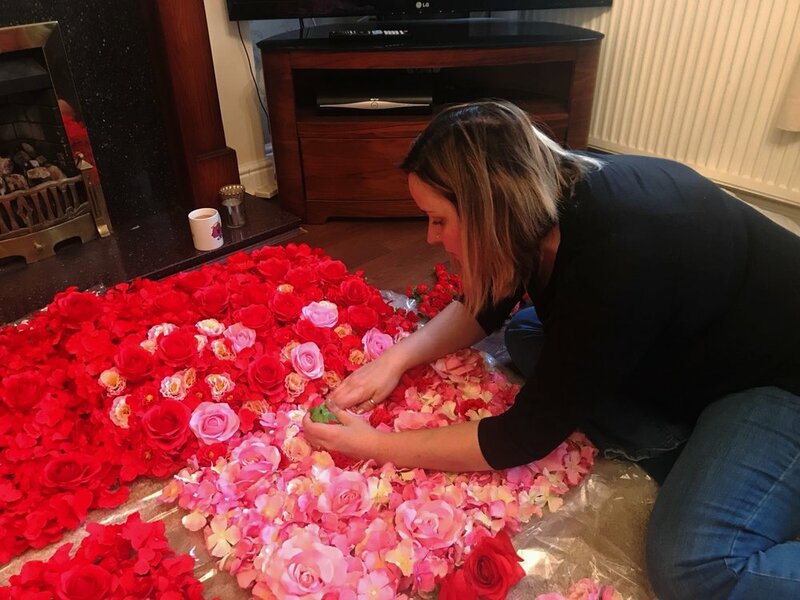 The large red flower bars (160cm x 40cm) can be ombre spread with additional flowers as in the images and personalised with any lettering, courtesy of the talented Sam at Crave Engrave. We built these around frames and handmade top and bottom panels, bespoke to this installation. We then hand finish and treated the wood to waterproof. This particular bar is from £300 to hire and from £500 to buy a complete installation. 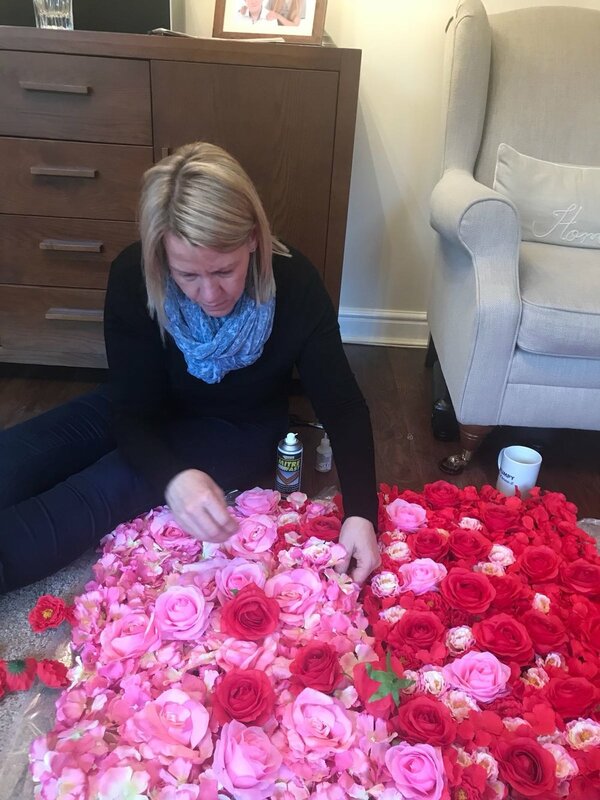 One of our gorgeous clients, Isabelle Warbuton, from Summer Bunny Studios in Stockton Heath, wanted a flower desk to ensure the best overall look for her salon. We produced this 98cm x 93.5 cm backdrop piece and secured it in to her front desk, which was a chest of drawers that she had purchased from Ikea. 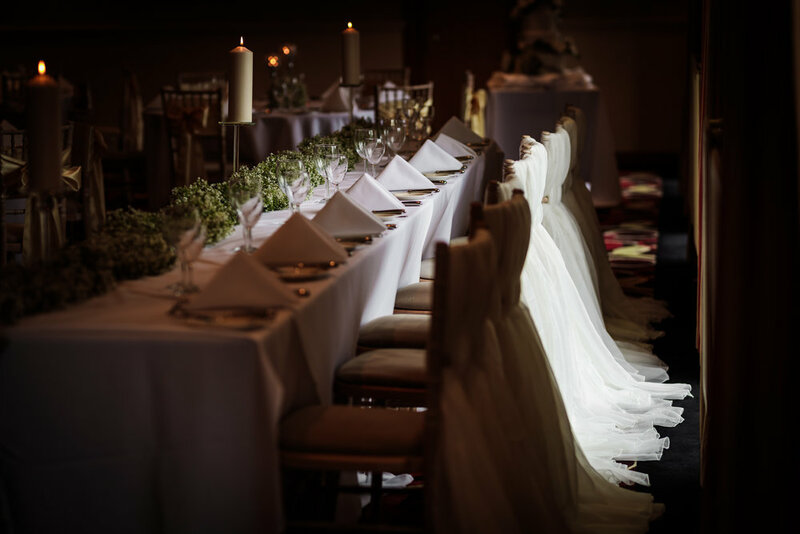 We think that you will agree that for £113 to permanently install the backdrop, it is a stunning addition to her business. a build time of two hours and an installation of half an hour, we feel that this piece is excellent value for money. Base panels for flower walls come in three different colours and are available ombred with flower colours of your choice. Handmade by Festival HQ. The second base panel colour is pink. Ombred flowers here bring in lilacs and whites. All Handmade by Festival HQ. 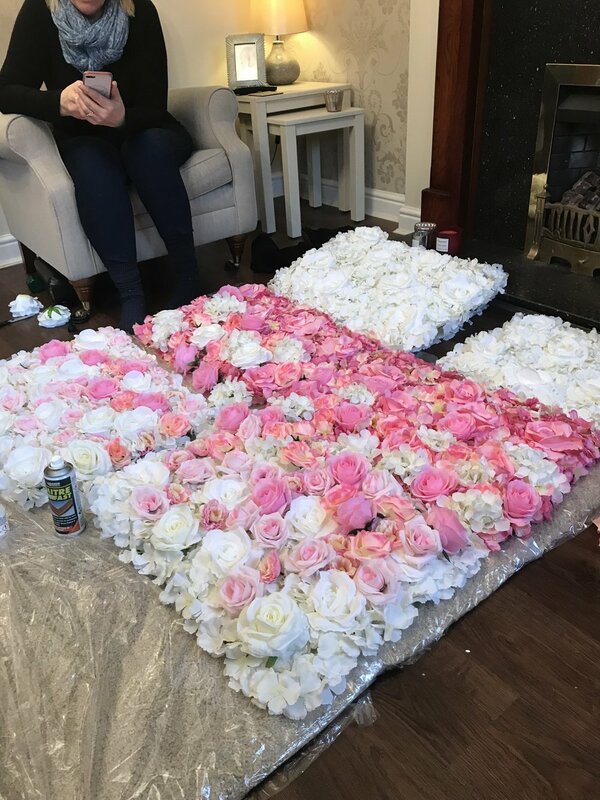 Flower wall panels available start from 2m x 1m and are hand crafted to perfection for your day. There are no limits when it comes to the size. As an example, base panels floral walls of 6m x 3m come with approximately 38,000 flowers and are hydrangea based. Flowers that ombre through the wall are matched precisely. Different coloured base panels can be attached together (60cm x 40cm) in any combination and pattern to create a beautiful gentle ombre effect pattern. Or for a more bespoke colour, we can make panels from scratch without a base colour. The options are limitless. Want them combined with materials, no problem. Want them personalising with wording or other hanging elements, no problem. The only limitation is within the imagination. If you have a vision, we have the capability. 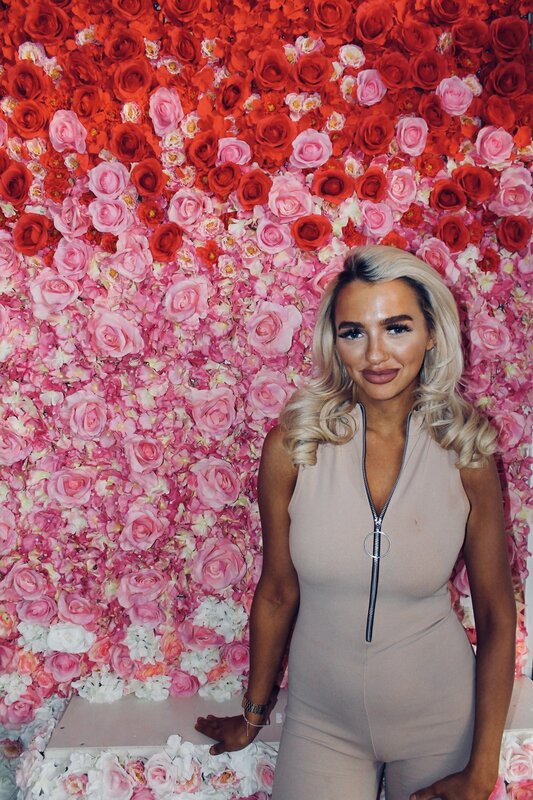 Flower walls make a perfect selfie station. This particular installation, lit by soft lights, was a roaring success at a recent event. 6ft x 6ft £150. We hand build all pieces to specification from the Client. For her permanent installation, Isabelle asked for red to pink to white, with ombre flowers inserted into each panel. The height is 3m 60 and the width 1 m 20. With a build time of 3 hours and an installation of 2 hours, we think that the total cost of just over £330 is a bargain and in fact we cannot find it more reasonably anywhere else. I truly bespoke piece that looks stunning in situ. Bring on the studio opening!! As a coordinating piece, Isabelle chose the flower panel for the desk above (white). With a permanent installation we offer maintenance to ensure that you get the best out of your flower wall. Nothing makes an entrance look more beautiful than floral swagging. 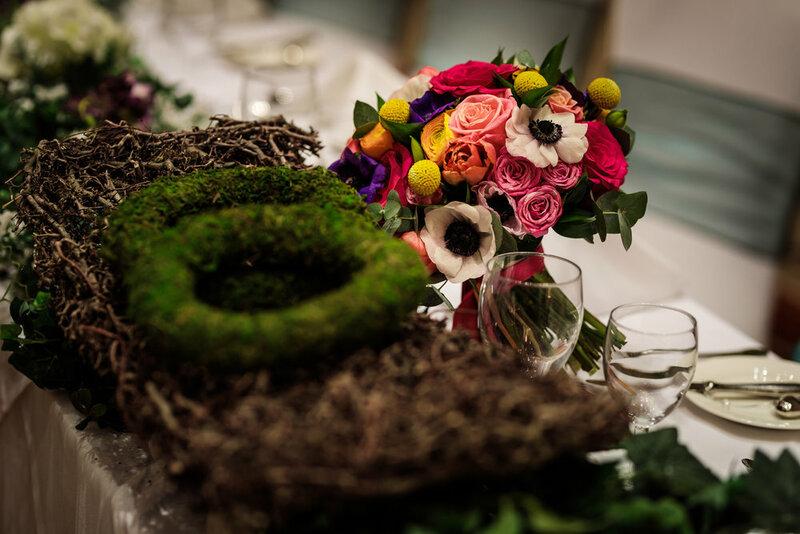 Handmade by Festival HQ and matched to your colour scheme, table decor or to the colouring of your venue. Each piece is handmade, bespoke to your colour scheme and is a real statement piece for your event. Swagging starts from £50 for simplistic roses woven around the location of your choice. We think you will agree that these are absolutely gorgeous. 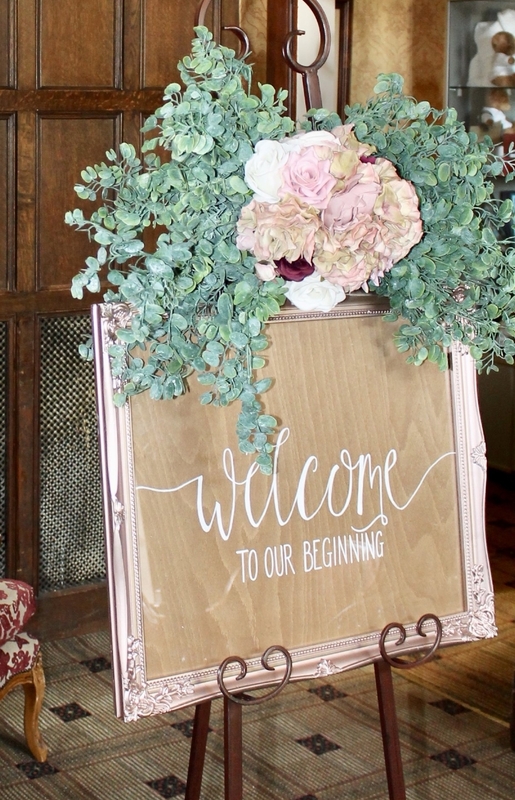 Florals can be a beautiful way to accentuate your event signage. This is a piece designed and Handmade by Festival HQ by our own fair hands! 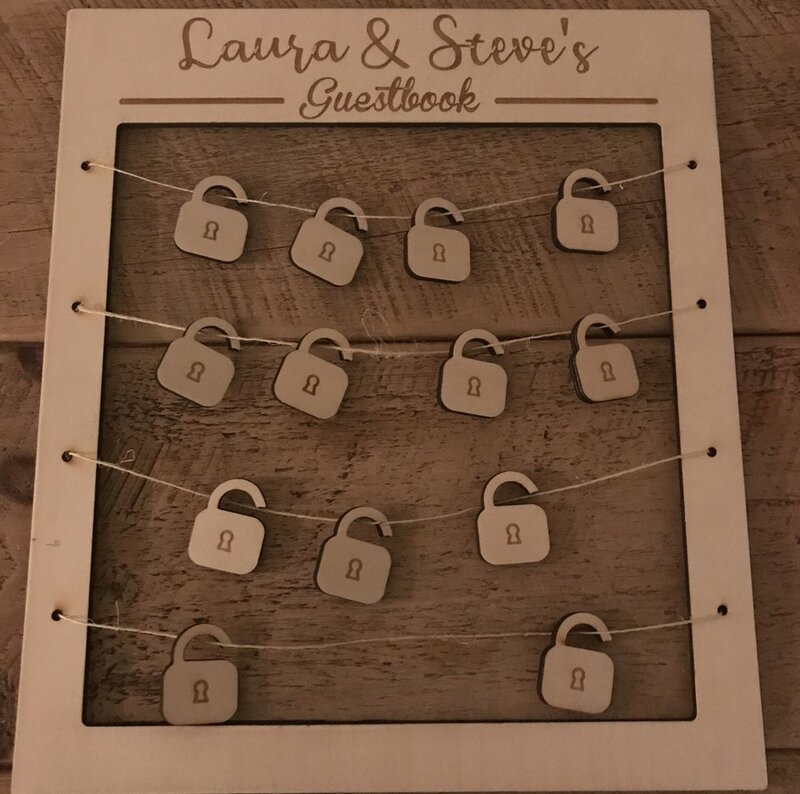 Alternative Guestbook, hand finished in Rose Gold. These can be made in any size and can be freestanding or easel based. Mirrored panels can be used to reflect the light around the room and the frames can be any design. These products are all Handmade at Festival HQ. 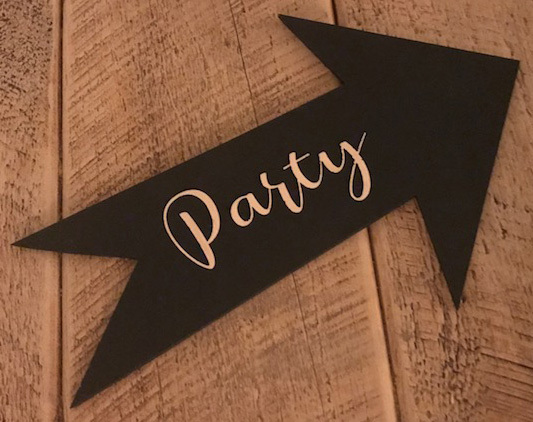 Wording can be personalised for bought pieces, or more generic wording pieces can be designed and made to hire. These pieces can also be floral swagged. Prices start from £45 to hire or £85 to buy. Love Locks piece, hand finished with chalk paint and Copper lettering. Again this piece can be finished in any effect and colour. Handmade by Festival HQ. One of our latest pieces, a Donut Wall with the capability of holding 70 Donuts. This particular piece can be customised in any colour or natural wood, with the Donuts sign in any chosen font. It can be floral swagged in the corners to pull your theme together. This particular piece is £45 to hire the unit or £100 fully loaded with 70 donuts and 10 spares for top ups (for basic glazed donuts. There are more donut options that can come at a higher cost. It starts with a drawing and becoming reality. All pieces are designed to scale with your venue or location in mind. Coming soon we have some bespoke material pieces hanging from a vintage barn in the heart of the Cheshire Countryside. Images of this will follow in February. We are very excited to announce a new Festival partnership with the very talented Gabrielle Anderson. Gabrielle's artwork and graphic design is quite simply stunning. Why not check out some of her pieces on her Instagram pages. Images of our partnership to follow.